Crown yourself as the greatest dancer in all the land with this Mens Disco King Costume. Everyone will bow to all your smooth moves. Everything from a swanky top to comfy pants will keep you in dancing form. 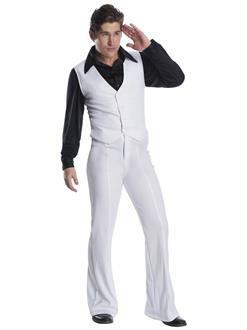 High kicks and thrusted hips will come naturally thanks to this Disco King costume. Show up to 70’s themed events and you’ll be treated like royalty.